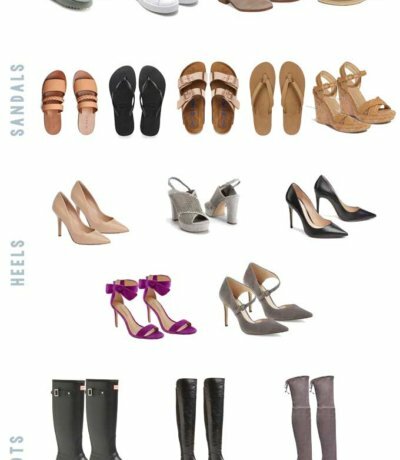 My capsule wardrobe includes a total of 37 items; 16 tops, 5 jackets, 3 dresses, 5 bottoms and 8 pairs of shoes. Caroline typically sticks to 37 items. I didn’t start out planning to match her exactly, but it ended so up that way. Through the end of March, I will mix and match only these items*. I’m curious to see what I wear the most and least (I’m not sure the ivory coat and heels will make many appearances, but I couldn’t bring myself to exclude them). Accessories and workout clothes are not included in the capsule wardrobe. If I had to choose scarves and handbags, it would have been much harder! The pieces I chose definitely reflect my current pregnant state. I love to wear sweaters in the winter, but there aren’t a ton of maternity options so I only included one. I’ve been living in a ton of layers – tanks and tees with a plaid or gingham shirt. You’ll notice lots of those on the list. I’m giving myself a little leeway…I only included one tank and tee, but I’ll be wearing them in white, black and grey to cover my belly so technically I do have more than 37 items. The pieces are a mix of new and old. Most of the newer items I had to purchase when I couldn’t fit into my regular tees or I was gifted them during the holidays (thanks family!). When I’ve been looking at new clothes, I ask myself if I would include the item in a capsule wardrobe. If it didn’t make the cut, I didn’t buy it. The most interesting aspect of putting it together was how much red was included! I gravitate toward neutrals – grey, black and white. I realized I like a little bit of color in my life with the red and blue shirts. Clearly I like my solids and stripes too. Over the next couple of months, I’ll share more about how these specific items made it into my collection and if there’s anything I feel I’m missing. 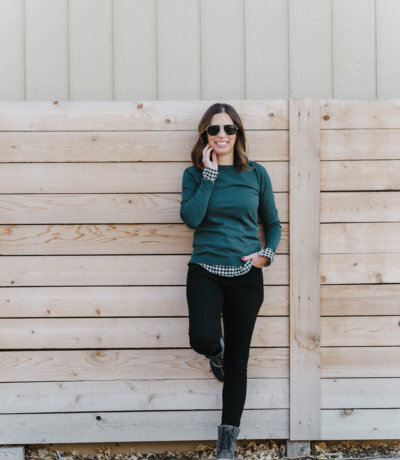 I like trying new things and I’m excited to see how I like the idea of a capsule wardrobe! * If I give birth prior to the end of March, I reserve the right to switch out some of these items for similar, non-maternity pieces. Or I’ll live in yoga pants and never leave the house. Also, we’ve been packing for an upcoming move and the other pair of shoes were already taped in a box. I’ll share a photo of them next week.